på juni 1, 2015, 10:56 a.m. The 1975 referendum couldn't do it. Why should this one? One of the most seductive arguments for holding an in-out referendum on the European Union is that it will settle the matter for decades to come: if the UK votes to stay in, we can then plan for the future without fearing a new campaign to shove us towards the exit door. In some circumstances this might be dismissed as bravado: a disloyal minister causing a self-serving fuss under the cloak of anonymity. However, ladies and gentlemen of the jury, I invite you to consider the evidence. Less than eight months ago, Scotland voted by a clear majority to remain part of the United Kingdom. Has all talk of a further referendum vanished from our airwaves? Is the Pope a Protestant? 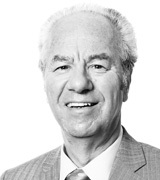 Last year, at a breakfast round table on the EU, I sat opposite William Cash, one of the Conservatives’ leading enthusiasts for Brexit. I asked him if he would accept an “in” majority at the coming referendum and stop campaigning for withdrawal. His answer was refreshingly direct: ‘Of course not’. If Ukip is still a viable party in 2017 (not, I grant, a certainty), we can safely assume that it will keep going, arguing that Cameron won the referendum on a false prospectus and demanding a new vote before long to out things right. Contrary to received wisdom, the 1975 referendum did NOT settle Britain’s place in Europe for a generation. 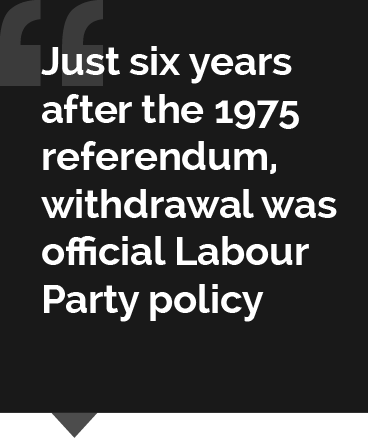 Just six years later, withdrawal was official Labour Party policy. It fought the 1983 general election promising to pull us out of the Common Market. It lost catastrophically. Neil Kinnock’s first decision when he became party leader six months later was to reverse party policy. It was the election defeat and Kinnock’s response that settled the issue, not the 1975 referendum. In recent years, two referendum decisions have been reversed by subsequent votes. In 2008, Stoke-on-Trent scrapped the post of elected Mayor, just six years after voting to establish it. Hartlepool lasted a bit longer: a referendum in 2001 set up the post; the town elected ‘H'Angus the Monkey’, re-elected him twice and then, in 2012, decided it was better off without a mayor at all. Given all that, the Sunday Telegraph story makes sense. We cannot assume that a ‘yes’ to the EU in the coming referendum will settle the matter for years, let alone decades, to come. Even a big majority does not guarantee permanence: the 1975 vote was won by two-to-one, yet this did not stop Labour’s Brexit wing from reopening the matter soon afterwards and getting their way within the party in 1981. Here’s the basic problem. Any functioning democracy must do two things (actually, it must do many more, but two are specifically relevant here). The first is the most obvious: to link the voice of the people to the way we take big national decisions. In a representative democracy, we do this by electing politicians from time to time to debate and decide on our behalf. The second property of a functioning democracy is almost as important. It has the ability to reverse its mistakes. If a government lets us down, we throw them out at the next election. If Parliament screws up, it can repeal bad legislation. The most obvious example in recent times was the poll tax, rolled out nationally in 1990, and sentenced to death in 1991. The problem with referendums is not just that they raise tricky questions about direct versus representative democracy, but that they have no set rules for enabling us to change our minds. We elect local councillors for four years and MPs for five – but how long does the ‘mandate’ of a referendum result last? Is twenty years right? Should it be ten… or thirty? No parliament can bind its successor. A law to fix the timespan for a referendum mandate could be repealed. And the fact that repeal is possible means that those who lose a referendum can revive their campaign the next day. Personally, I would ban all referendums. British democracy evolved perfectly well without them until the 1960s. Indeed, had referendums been central to Britain’s political traditions, evolution might well have been much slower. In Switzerland, women did not finally achieve parity with men in national elections until the 1970s – because it needed men to vote, in a referendum, to dilute their power. Sadly, the referendum horse has bolted. They are here to stay. And so is the uncertainty and frustration that they engender. That is the consequence of parties – first the Conservatives and now Labour – treating the issue of a referendum on Europe as one of party management and tactical calculation rather than profound constitutional significance.